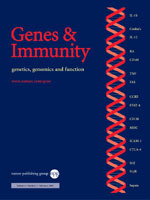 Genes and Immunity is a journal dedicated to functional genetics of the immune response. Genes and Immunity emphasizes studies that demonstrate genetic, genomic or functional variation in the immune system, and assist our understanding of how the basic control over the immune system varies between individuals both in health and disease. The emerging role for genes outside the MHC will be of particular interest.